The Denver Broncos' defense pounded the Carolina Panthers into submission, winning Super Bowl 50 on Sunday, Feb. 7, 2016 at Levi's Stadium in Santa Clara, Calif., 24-10. Head coach Gary Kubiak of the Denver Broncos is splashed with Gatorade in the final moments of Super Bowl 50 at Levi's Stadium on February 7, 2016 in Santa Clara, Calif.
Confetti falls as the Denver Broncos celebrate defeating the Carolina Panthers 24-10 in Super Bowl 50 at Levi's Stadium on February 7, 2016 in Santa Clara, Calif.
Ryan Harris of the Denver Broncos celebrates after defeating the Carolina Panthers during Super Bowl 50 at Levi's Stadium on February 7, 2016 in Santa Clara, Calif.
Cody Latimer #14 of the Denver Broncos reacts as the Denver Broncos defeat the Carolina Panthers 24-10 during Super Bowl 50 at Levi's Stadium on February 7, 2016 in Santa Clara, Calif.
C.J. Anderson of the Denver Broncos celebrates after scoring a 2-yard touchdown in the fourth quarter against the Carolina Panthers during Super Bowl 50 at Levi's Stadium on February 7, 2016 in Santa Clara, California. Denver Broncos strong safety T.J. Ward runs with the ball after making an interception during the second half of Super Bowl 50 between the AFC Champion Denver Broncos and the NFC Champion Carolina Panthers at Levi's Stadium in Santa Clara, Calif.
Denver Broncos strong safety T.J. Ward (left) intercepts the ball intended for Carolina Panthers wide receiver Ted Ginn (center) as Denver Broncos cornerback Aqib Talib (right) covers during the second half of Super Bowl 50 between the AFC Champion Denver Broncos and the NFC Champion Carolina Panthers at Levi's Stadium in Santa Clara, Calif.
Carolina Panthers wide receiver Ted Ginn Jr. (right) stays clear of Denver Broncos wide receiver Cody Latimer (left) during the second half of Super Bowl 50 between the AFC Champion Denver Broncos and the NFC Champion Carolina Panthers at Levi's Stadium in Santa Clara, Calif.
Josh Norman #24 of the Carolina Panthers reacts after a turnover by the Denver Broncos in the fourth quarter during Super Bowl 50 at Levi's Stadium on February 7, 2016 in Santa Clara, Calif.
Derek Wolfe of the Denver Broncos reacts after sacking Cam Newton of the Carolina Panthers during Super Bowl 50 at Levi's Stadium on February 7, 2016 in Santa Clara, Calif.
Carolina Panthers head coach Ron Rivera argues with line judge Rusty Baynes during the second half of Super Bowl 50 between the AFC Champion Denver Broncos and the NFC Champion Carolina Panthers at Levi's Stadium in Santa Clara, Calif.
Denver Broncos tight end Virgil Green is tackled by Carolina Panthers free safety Kurt Coleman during the first half of Super Bowl 50 between the AFC Champion Denver Broncos and the NFC Champion Carolina Panthers at Levi's Stadium in Santa Clara, Calif.
Carolina Panthers defensive end Kony Ealy intercepts the ball intended for Denver Broncos wide receiver Emmanuel Sanders during the first half of Super Bowl 50 between the AFC Champion Denver Broncos and the NFC Champion Carolina Panthers at Levi's Stadium in Santa Clara, Calif.
Denver Broncos quarterback Peyton Manning directs his linemen during Super Bowl 50 against the Carolina Panthers at Levi's Stadium in Santa Clara, Calif., on February 7, 2016. Denver Broncos wide receiver Jordan Norwood runs back the longest punt return in Super Bowl history in the second quarter of Super Bowl 50 between the AFC Champion Denver Broncos and the NFC Champion Carolina Panthers at Levi's Stadium in Santa Clara, Calif.
Quarterback Peyton Manning of the Denver Broncos calls the play during Super Bowl 50 against the Carolina Panthers at Levi's Stadium in Santa Clara, Calif., on February 7, 2016. C.J. Anderson of the Denver Broncos is taken down during Super Bowl 50 against the Carolina Panthers at Levi's Stadium in Santa Clara, Calif., on February 7, 2016. Denver Broncos tight end Virgil Green is tackled during Super Bowl 50 against the Carolina Panthers at Levi's Stadium in Santa Clara, Calif., on February 7, 2016. Head coach Ron Rivera of the Carolina Panthers looks on in the second quarter against the Denver Broncos during Super Bowl 50 at Levi's Stadium on February 7, 2016 in Santa Clara, Calif.
Denver Broncos cornerback Chris Harris Jr. celebrates during Super Bowl 50 against the Carolina Panthers at Levi's Stadium in Santa Clara, Calif.
Cam Newton #1 of the Carolina Panthers throws the ball against the Denver Broncos during Super Bowl 50 at Levi's Stadium on Feb. 7, 2016 in Santa Clara, California. Peyton Manning #18 of the Denver Broncos gestures in the first quarter against the Carolina Panthers during Super Bowl 50 at Levi's Stadium on Feb. 7, 2016 in Santa Clara, California. Bradley Roby #29 of the Denver Broncos looks on prior to Super Bowl 50 at Levi's Stadium on Feb. 7, 2016 in Santa Clara, California. Carolina Panthers running back Jonathan Stewart jumps into the end zone for a touchdown during Super Bowl 50 against the Denver Broncos at Levi's Stadium in Santa Clara, California, on February 7, 2016. Denver Broncos safety T.J. Ward celebrates after a sack of Carolina Panthers quarterback Cam Newton in the first quarter of Super Bowl 50 between the AFC Champion Denver Broncos and the NFC Champion Carolina Panthers at Levi's Stadium in Santa Clara, Calif.
Carolina Panthers quarterback Cam Newton drops back to pass in the first quarter of Super Bowl 50 between the AFC Champion Denver Broncos and the NFC Champion Carolina Panthers at Levi's Stadium in Santa Clara, Calif.
Carolina Panthers running back Fozzy Whittaker (R) carries the ball up field as Denver Broncos strong safety T.J. Ward (L) defends during the first quarter of the NFL's Super Bowl 50 between the AFC Champion Denver Broncos and the NFC Champion Carolina Panthers at Levi's Stadium in Santa Clara, Calif.
Graham Gano of the Carolina Panthers kicks off to start Super Bowl 50 against the Denver Broncos at Levi's Stadium on Feb. 7, 2016 in Santa Clara, Calif.
Peyton Manning of the Denver Broncos prepares to hike the ball in the first quarter against the Carolina Panthers during Super Bowl 50 at Levi's Stadium on February 7, 2016 in Santa Clara, Calif. The Blue Angels perform a flyover prior to Super Bowl 50 between the Denver Broncos and the Carolina Panthers at Levi's Stadium on February 7, 2016 in Santa Clara, Calif.
Peyton Manning of the Denver Broncos looks to hand the ball off in the first quarter against the Carolina Panthers during Super Bowl 50 at Levi's Stadium on February 7, 2016 in Santa Clara, Calif.
Cam Newton #1 of the Carolina Panthers warms up prior to Super Bowl 50 against the Denver Broncos at Levi's Stadium on Feb. 7, 2016 in Santa Clara, California. A Denver Broncos fan looks on prior to Super Bowl 50 between the Denver Broncos and the Carolina Panthers at Levi's Stadium on Feb. 7, 2016 in Santa Clara, California. The Carolina Panthers take the field during introductions prior to Super Bowl 50 at Levi's Stadium on February 7, 2016 in Santa Clara, Calif.
Past Super Bowl MVPs look on during Super Bowl 50 between the Denver Broncos and the Carolina Panthers at Levi's Stadium on February 7, 2016 in Santa Clara, Calif.
Singer Lady Gaga performs during Super Bowl 50 between the Denver Broncos and the Carolina Panthers at Levi's Stadium on Feb. 7, 2016 in Santa Clara, California. Fans look on during Super Bowl 50 between the Carolina Panthers and Denver Broncos at Levi's Stadium on Feb. 7, 2016 in Santa Clara, California. 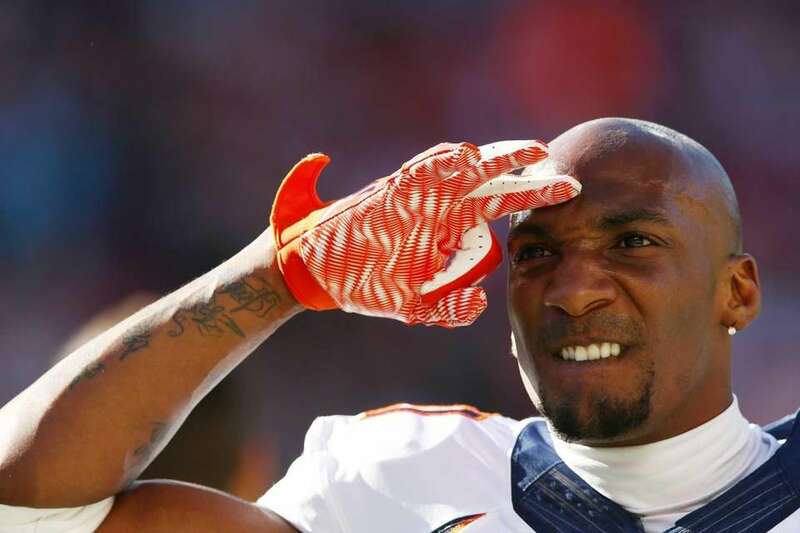 Aqib Talib of the Denver Broncos warms up before Super Bowl 50 at Levi's Stadium on Feb. 7, 2016 in Santa Clara, Calif.
Peyton Manning #18 of the Denver Broncos looks on during warm ups prior to Super Bowl 50 against the Carolina Panthers at Levi's Stadium on Feb. 7, 2016 in Santa Clara, California. A Carolina Panthers fan looks on prior to Super Bowl 50 between the Denver Broncos and the Carolina Panthers at Levi's Stadium on Feb. 7, 2016 in Santa Clara, California. Members of the Denver Broncos enter the field prior to playing in Super Bowl 50 against the Carolina Panthers at Levi's Stadium on February 7, 2016 in Santa Clara, Calif.
Thomas Davis of the Carolina Panthers warms up prior to playing in Super Bowl 50 at Levi's Stadium on February 7, 2016 in Santa Clara, California. Linebacker Luke Kuechly of the Carolina Panthers warms up prior to playing in Super Bowl 50 at Levi's Stadium on February 7, 2016 in Santa Clara, Calif. Defensive back Teddy Williams of the Carolina Panthers warms up prior to Super Bowl 50 at Levi's Stadium on February 7, 2016 in Santa Clara, Calif. Fans stand outside of Levi's Stadium prior to Super Bowl 50 between the Denver Broncos and the Carolina Panthers on Feb. 7, 2016 in Santa Clara, California. Relive the Super Bowl halftime magic right nowHighlights from the Super Bowl 50 halftime show, featuring Coldplay, Bruno Mars, Beyonce and ... ... Super Bowl 50's halftime show an instant classicAnd, yes, there was a dance-off. Beyonce releases surprise song before Super BowlIt's another surprise Beyonce project.